JAPAN: Sony develops high-speed single-lens 3D camera | What Hi-Fi? The new camera is said to get over some of the problems of existing 'half mirror' twin-lens 3D cameras, which require complex internal technology to keep the 3D image aligned when zooming or changing focus. The Sony design uses mirrors instead of shutters, allowing the 'left eye' and 'right eye' images to be captured simultaneously. What's more, the speed with which the images are captured means that even when watching 3D images without the special glasses required, the 2D image doesn't appear blurred. 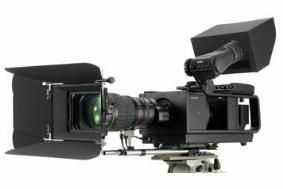 At the heart of the new camera is a new 240fps CMOS sensor, Sony saying this makes the camera particularly suited to shooting rapid action, such as sports events. We'll bring you more about the demonstrations in our CEATEC Japan 2009 coverage, starting next Tuesday.